With a quarter of the season in the books (for everybody except the Miami Dolphins and Tampa Bay Buccaneers), it’s time to start recognizing the players that have been standing out thus far this season, with a look at what the All-Pro team would look like if the season ended today. Elite Stat: Brady currently holds the league’s highest passer rating under pressure at 138.5. Typically quarterbacks struggle in the face of pressure, but Tom Brady through one month of the season has a passer rating of 138.5 when hurried. Not only is that better than any other passer when pressured, but it’s better than any other quarterback’s passer rating when they are kept clean in the pocket. Brady has been sensational again through the first quarter of this season, even if this Patriots team doesn’t seem as good around him as it was a season ago. Elite Stat: Hunt has forced a total of 25 missed tackles on carries alone – more than any other RB has forced on runs AND receptions, combined. Kareem Hunt has been one of the stars of the young season. Last season’s No. 1 graded running back in college at PFF, Hunt has hit the ground running in the NFL, and since fumbling with his first professional carry, has done nothing but dominate for Kansas City. Hunt has broken 31 total tackles on just 81 touches between carries and receptions, and has an elusive rating two times higher than any other back. Elite Stat: Diggs sees a 149.9 passer rating when targeted – a massive 17.3 points higher than the next closest WR with a minimum of 20 targets. Stefon Diggs has been looking more and more like Antonio Brown as his career has progressed. Not only does he lead the league in receiving yards, but he does so without his starting quarterback throwing him the ball for three of those games, and he has made numerous tough catches over that span, going up and taking the ball away from defensive backs in the manner of a guy several inches taller than he is. Elite Stat: Green is averaging 2.30 yards per route run, seventh-best in the league. A.J. Green has been the victim of the Cincinnati offensive struggles, but just because his overall output hasn’t been as strong as it has been in the past, it would be a mistake to ignore how good he has been. Green has caught 71.4 percent of the passes thrown his way, which is the highest mark of his career, and has still made several big plays. Elite Stat: Gronk’s 2.27 yards per route run are the second-most for any TE so far this season. Rob Gronkowski continues to be the standard of the modern day tight end. Gronk has gained 2.27 yards per route run, second in the league, but what always separates him from other top receiving tight ends is how well he blocks. In three of the four games he has played in this season his blocking in the run game has been exemplary, and at the moment he is helping offset a Patriots offensive line that has been struggling. Elite Stat: Brown fields an average of 2.66 yards per route run, third-highest in the league. Antonio Brown remains one of the game’s best receivers, and despite being covered by some top cornerbacks so far this season has still been extremely productive. Brown has a quickness and decisiveness to his movement that makes him extremely tough to bottle up, and only Stefon Diggs and Julio Jones have gained more yards per route run this season. Elite Stat: On 190 pass blocking snaps, Thomas has yet to allow a sack, the most snaps of any tackle without an allowed sack this season. Joe Thomas hit a milestone of 10,000 consecutive snaps played since entering the league over the first month of the season. If you count plays that were nullified by penalty he exceeded that some time ago, but despite all that mileage he remains the standard by which all left tackles are measured. Thomas has allowed just six total pressures across four games so far. Elite Stat: Incognito has yet to allow a QB Hit this season, on 127 pass block snaps. Since coming back into the league there have been few better guards than Buffalo’s Richie Incognito. This season he has been part of a Buffalo team that has overachieved, and he has allowed just three total pressures through four games. Incognito has also run blocked well, though he is coming off his worst game of the season against the Atlanta Falcons. Elite Stat: Mack sees a pass blocking efficiency mark of 99.5, having surrendered just 1 hurry all season. 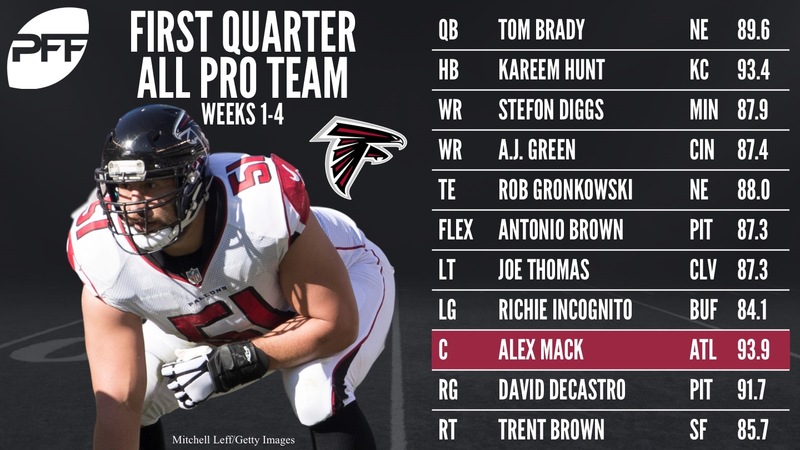 Alex Mack has been arguably the best player at any position in the league through the first month of the season. The former Cleveland Brown isn’t just back to his best, but is playing better than he ever has before in his NFL career. Mack has allowed just one hurry and no other pressure across four games this season, has yet to be penalized, and has been one of the game’s best run blockers, instrumental in the Falcons zone blocking plays. Elite Stat: DeCastro has seen 148 pass blocking snaps, and allowed just 3 hurries. Pittsburgh’s offensive line as a whole has been less dominant than it was a season ago, but David DeCastro is playing the best football of his career through the first month of the season. DeCastro has yet to allow Ben Roethlisberger to be sacked or hit, and has allowed just three hurries across his four games, while run blocking well, particularly on the move when he is asked to pull block. Elite Stat: Brown has allowed just 5 total pressures – tied for sixth-fewest among tackles with at least 100 pass block snaps. One of the surprises of the young season is the play of 49ers RT Trent Brown. Brown, at 6 foot 8 and 360 pounds has been a revelation as a pass blocker, allowing just five total pressures so far this season, and doing so against some high-level defenses. Brown shut out both the Panthers and Seahawks, and was impressive against the Rams and Cardinals. Elite Stat: No interior defender has more pressures than Buckner through four games, as his 23 total pressures are 3 more than the next player. DeForest Buckner certainly benefits from some of the offensive lines he has gone up against, but a player can only beat what is in front of them, and Buckner has certainly done that. He only has one sack, but Buckner has 23 total pressures, a batted pass and eleven defensive stops to his name across the first four weeks of the season. Elite Stat: McCoy ranks in the top 10 in pass-rush productivity (eighth), while also accruing five stops in run defense, despite playing one less game than other DIs. Somehow Gerald McCoy has yet to register a sack, but he has taken the quarterback down six times and hurried him another ten, while consistently knifing into the backfield and destroying blocking schemes with his quickness and penetration. McCoy has also been a force in the run game, which hasn’t always been true about his performances, making him one of the biggest impact players of this season. Elite Stat: Mack’s 10 stops in run defense are the second-most of any edge defender. Khalil Mack was our highest-graded edge defender a season ago and he doesn’t look keen to relinquish that crown in 2017. He has four sacks, four hits and nine additional hurries to his name after four weeks, and is second among all edge defenders with 15 defensive stops. Mack has been a force in both the run and pass game and is one of the game’s most complete and destructive defenders. Elite Stat: Lawrence’s 20.2 pass-rush productivity mark is almost a full 1.0 higher than the next closest edge defender. DeMarcus Lawrence has generated more pressure than any other defender in the game through the first four weeks of the season. In fact, with 30 total pressures, eight of which are sacks, there is nobody else even close to the volume of pressure Lawrence has been able to produce and his PFF pass rush grade of 92.5 is almost five points higher than any other edge defender. Elite Stat: Wagner is tied for first with his 12 run stops, and also second among all linebackers with his 25.0 pass-rushing productivity mark. 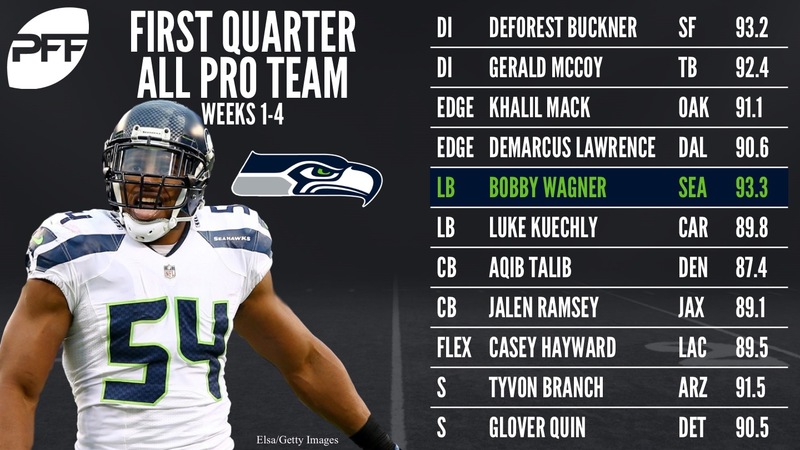 Bobby Wagner is another player looking to retain his place on the All-Pro team from a season ago, and he is going about it in the right way so far this year. Wagner is one of the most complete players in the game, ranking joint second among linebackers in defensive stops (18), but also having picked off a pass, broken two up and earned a sack, hit and three hurries on the blitz for the Seahawks. Elite Stat: Kuechly has allowed just 0.78 yards per snap in coverage, 12th-lowest among all linebackers. Luke Kuechly is the game’s best coverage linebacker, and over four games he hasn’t allowed a pass into his coverage longer than 14 yards, while notching an interception and a pass breakup on the 20 targets that have come his way. Kuechly has also performed well in the run game, sifting his way through traffic to make stops or taking on blockers at the point of attack. Elite Stat: Talib’s 0.41 yards per snap in coverage are the fifth-lowest of any CB with at least 87 snaps in coverage. If there was any concern about whether Aqib Talib could maintain his high level of play from 2016, he has answered those resoundingly so far. Talib has two pass breakups and an interception to his name, returning that more than 100 yards against the Cowboys to seal that win, and he could have had more interceptions if Dez Bryant hadn’t spent much of that game playing defensive back and ensuring Talib couldn’t come up with another pick. Elite Stat: Quarterbacks targeting Ramsey see just a 23.4 passer rating. Jalen Ramsey may be the league’s next great cornerback. So far this season teams throwing his way have a passer rating of just 23.4, which is more than ten points lower than if they just threw the ball at the floor every snap instead. He has been targeted 19 times and has yet to allow a catch longer than ten yards, having surrendered just 42 yards across four games. Elite Stat: Branch has already made 10 stops in run defense, two more than any other safety this season. Tyvon Branch has rediscovered the play of his youth so far in 2017, and though he hasn’t recorded either an interception or pass breakup, he has notched 14 defensive stops, which is three more than any other safety. When targeted in primary coverage he has allowed an average of just 4.4 yards per catch, and has a pair of QB hits on the bitz. Elite Stat: Quin is one of just seven safeties with at least 80 snaps in run defense, and no missed tackles. One of the keys to the Lions impressive start this season has been the play of safety Glover Quin, who has notched a pair of interceptions already this year and been a real force on the back end for the Lions. Quinn also has nine defensive stops to his name and has been the leader of a secondary that has been vastly improved this season. Elite Stat: Not afraid to mix it up, Hayward ranks eighth among cornerbacks with his 3.3 run stop percentage. Casey Hayward has developed into one of the game’s best cornerbacks. Once seen as a slot corner only, Hayward got an opportunity to play outside, and then become the team’s No. 1 corner because of injury, and he hasn’t looked back. This year, he doesn’t have the interception total of a season ago, but he has broken up five passes and made seven defensive stops. Matt Prater has been money for the Lions this season, an while he hasn’t attempted nearly as many field goals as some other kickers (just nine so far), he has attempted more from 50+ yards than anybody, and made four of the five he has lined up from that distance. Prater has also been averaging 71.4 yards on kickoffs, and helped the Lions to an average start position on defense inside the opponent’s 25-yard line. The fake punt this past week wasn’t his finest hour, but King’s ability to boom the ball into the stratosphere has been a huge boost to a Raiders team that has struggled on offense far more than people were anticipating. King has seen one punt this season hit a hang time of 5.4 seconds. McKenzie has made a big impact, averaging 11.1 yards per punt return, but it would have been even more had his long touchdown not been wiped off the board thanks to a penalty this past week against Oakland. The rookie showcased his game breaking speed and is someone to keep an eye on as the season wears on. Mostert has been outstanding on special teams for the 49ers, registering two tackles on punt returns and forcing fair catches on another two just this past weekend.. The former Purdue Boilermaker has played on the kick coverage, kick return, punt coverage and punt return units, and figures to be a key special teamer for the 49ers this season.